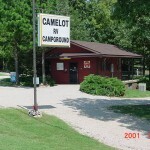 Veteran Owned Campground. We are NOT in a flood area….. Address: 4728 Hwy 67 N Use GPS location: 100 Camelot Dr. Your 7th day is free. Total Sites 76 Open & Shady Level Sites, with room for your Slideouts and Tows. Full Hookups 76 All sites have Water, Sewer, Electric 30/50 amp. Free Cable TV 61+ Channels: FOX-CNN etc. click on cable TV-WiFi at top to see listings. Free WiFi internet At All Sites. LP/Propane Bottles and RV’s filled. No filling after dusk/dark, or on Sundays or Holidays. 30 Amp Electric At all sites. 50 Amp Electric At all sites. Weekly rates Your 7th day is free. Monthly Extended stays Yes, see price at bottom of page. Dates open Open Year Round. If office is closed call we live on premises. Restrooms Yes Open Year Round. Showers Yes Shower rooms only will close from late Oct to sometime in April. Laundry Yes Open Year Round. Phone Yes, Free 24 hour courtesy phone for local calling only. Fire Pits or Grills None provided, please bring your own. Dump Station All sites have sewer hookups for our customers-no public dumping. Pets Allowed Keep on leash (some breed restrictions) Doberman, Pit Bull, Rottweiler, Chow, Wolf Hybrids, or any type of aggressive pets. House pets only, use designated pet area, pick up after. Tents No ground tents on any sites. Too “Cold” up North, too “Hot” down South, come stay a while with us. 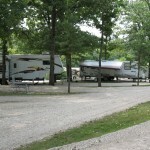 YOU CAN STAY AND ENJOY THE AREA OR MAKE US A CONVENIENT OVERNIGHT STOP. Weekly rates: Stay 6 consecutive nights your 7th night is free. Consecutive Monthly Extended stays: $380.00 for 2 or less people. All sites have; Water, Sewer, Electric 30/50amp, Cable TV, WiFi. 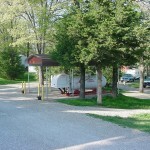 Laundry, and Propane station on premises. Trash, lawn, and streets are maintained. Some food services deliver to your site. METHOD OF PAYMENT: Cash, Personal Check or Traveler Check. No Credit/Debit Cards. 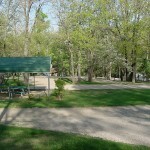 Click on Photos at the top to see more pictures of our campground.